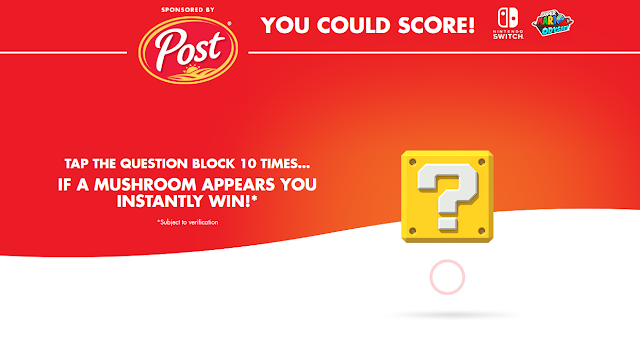 KoopaTV: Alternate Mode of Entry to Post Cereal Sweepstakes: Win a Nintendo Switch! I'm going to try to enter at 5 AM. Maybe I'll win something in that time. I just made the mistake of trying again right now. That's when EVERYONE ELSE will try. Well, I did help out somebody win a $1,000 prize, so I can vouch that these time-based contests are legit. Did you get a kickback? No, it's all on the winner's part. To his or her credit, the winner did say it'll take weeks to receive the prize because of a release form he or she'll have to sign, since winners get published. As in, did/will the winner give you anything as a thank-you once they receive it? Not yet, and I don't know if the winner plans to. In the same contest, I got $20 out of it, so it isn't one-sided. I see the $1,000 winner! You only told them to remember you if they win the $10,000. Big mistake! If I were to win, I would sell the Switch on eBay and use the money to buy 4-5 future Switch games and a pro controller. That doesn't sound like enough proceeds to fund all of that, but hey, prioritise the Pro Controller. Eh, I find the Pro Controller unnecessary. Some upcoming indie games are $30-$40. I usually wait for some sales, too. A few weeks ago, for instance, I bought Rocket League for half off at Best Buy. Well, what I meant to say was, the Joy Con Grip does a good job.